One area where incumbent companies continue to lose against their upstart disruptors is in the area of user/customer experience. It’s actually the wedge disruptors use to insert themselves into the relationship between the customer and the old provider/incumbent. It’s how Uber inserted itself between riders and taxi drivers. It’s how Apple killed Blackberry. It’s why Tesla/Solarcity is scaring the old utilities. Interestingly, user experience improvements is an area where the old companies can quickly utilize the new technologies available, specifically machine learning/AI and robotic process automation, to catch up to their competitors quickly. The incumbent companies possess troves of data on customer interactions that would enable them to provide customer context-aware interventions (in addressing customer issues) and more delightful customer support experiences. Few industries fail to keep up with the times, especially as it relates to user experience, as poorly as the utility industry. So it’s a perfect example of how not to do customer experiences or issue resolution. Customers traditionally had two interactions with utilities; when they paid their bills or when their power went out. These interactions are not positive ones. And this plays out in our analysis of customer support and customer interactions on Twitter. In training our context-aware chatbot product for utility customer service, we decided to mine Twitter for thousands of customer service interactions that happen there every day. We wanted to see what we could learn and also use the interactions, as one of many inputs, to train Powerbot. The AI models/method that works best for chatbots is Generative Adversarial Models/GANs. GANs learn a probability (high dimensional) distribution over training data. ii) it can then output new models similar to the training data. They offer a path towards unsupervised learning and is a hot segment of AI right now. GANs have two neural networks i) generator (takes random noise as input and synthesizes content) ii) discriminator (already trained/learned what real signals look like and can determine if the generators content is real or fake). Mining Twitter produced a goldmine of insights. Knowing that Twitter is probably not representative of the typical interaction, our view was that the short length of the characters Twitter allows ensures that the customer is concise and describes their problems (which we found to be the case) but the idea is that once we partner with a utility, the data from the utility will help with personalization/customization of the support staffs engagement with the customer. Power outages and service recovery tend to be the most recurring requests/questions asked on Twitter. And people tend to be (shall we say) upset desiring immediate rectification of their issues. 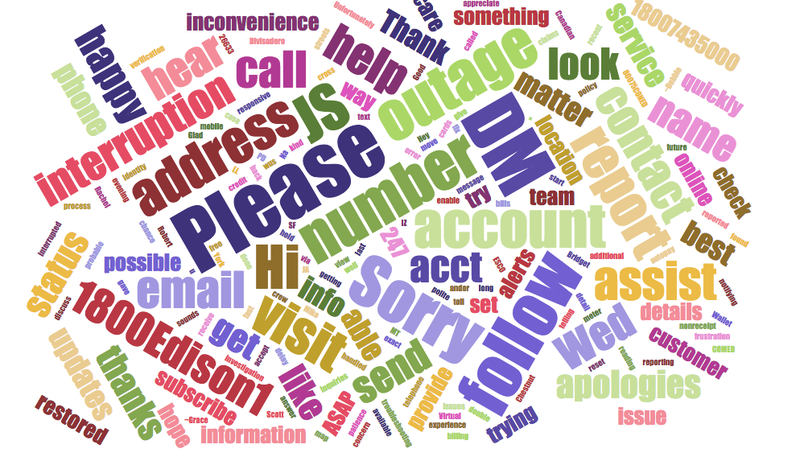 Where the disconnect lies is that the customer service rep almost always, as can be seen from the word cloud of the responses below i) provides a number to call ii) asks to go to DM or iii) asks for more information to figure out what might be wrong. This adds an extra layer of frustration for the customer. The failure of the process of resolving issues on Twitter can be seen clearly by looking at where it fails in the customer issue resolution flowchart below. From the standard issue resolution flowchart seen below, Stage 1 Frontline Resolution, which is the path a response to a complaint on Twitter would go, stops being effective for resolving Twitter issues from the 2nd step. The flowchart requires that the support employee ‘provide a decision on the complaint within five working days unless there are exceptional circumstances’. Pretty ineffective when the customer requires an immediate response. an optimal issue resolution path where the AI picks the best response for the support staff to use in their communication with the customer, avoiding the current cut-and-paste approach to customers interactions. This level of customization and the ability to contextually serve a customer of 1, even in real-time, will enable the incumbent companies (utilities in this case) to start to compete with their upstart competitors who already have this level of service in their DNA. The only way for the incumbents to compete, and be in with a chance of winning the customer's loyalty back, is for them to utilize the assets they have (vast amounts of data) to personalize the experiences for the customers. It’s a way for the incumbents to take advantage of their past and combine it with advanced technology to ensure relevance in the future.